Up very early and off to Paddington Station to meet our London Walks guide for our tour of Oxford and the Cotswolds. We all met by the ticket office at Platform 1, boarded the train and arrived at Oxford about 90 minutes later. The entire journey was pretty much done in a white out – the ground outside of London is still covered in a blanket of white snow and the weather was incredibly foggy. You really couldn’t see much more than 20 feet from either side of the train. A coach was waiting for us and we traveled to the lovely little village of Minster Lovell – detailed post to follow. Suffice to say that the village is filled with thatched cottages, narrow lanes, stone bridges over babbling rivers, etc etc. Reader, it was to die for. Didn’t take me long to pick out which cottage I wanted. Then it was off to Burford, a much larger town, where we had lunch and browsed the shops. Final stop in Oxford, where we took a walking tour. Greg and I peeled off from the group near the end to take care of the essential Three P’s of Touring as set down by myself and Victoria. The Three Ps are – a pint, a pee and a peek at anything that’s caught your eye. In this case, it was the Grapes (pee and pint both dispatched) and Waterstone’s bookshop, where I bought books by my favorite English authors that aren’t available in the States or on B&N website – a post on this soon. We arrived back in London at 7 and went to Boisdale of Belgravia for dinner – potato and leek soup (hot and warming) and Angus beef burgers (yummy). Fell into bed and watch the first episode of a new show called Rock and Chips – later post. So, today is a leisurely day with no time tables – going to walk down the Mall and snake my way into St. James’s Street. Will walk Piccadilly, look round Shepard’s Market, pop into Fortnums, Hatchard’s and the Burlington Arcade, toddle my way down to Charing Cross Road and perhaps see a matinee of “When We Are Married” playing at the Garrick, etc etc. Nothing more than a rambling day round London Town. . . Oh, joy! Heaven, I'm In Heaven . . .
We made it, we’re in London! Woo Hoo! No problems with the flight, arrived at our hotel around 11:30 a.m. and the room was ready. Unpacked and went to Victoria Station to get some money from the ATM, then on board the Hop On, Hop Off tour bus for a whirlwind trip round London. We crossed the Thames four times!? Wow, was Oxford Circus and Regent Street packed with people. Hamley’s was jammed. Harrod’s closed today – jinormous sale starts tomorrow. You can bet we won’t be there. We plan to do the alternate bus tour tomorrow, then the river cruise, then the Tower, then dinner at Ye Olde Cheshire Cheese, then the Ripper Walk with Donald Rumbleow. It’s cold here, but no worse than New Jersey. Had dinner in the carvery here in the hotel – roast beef, Yorkshire pudd, gravy, veg and dessert – straight down the road to Gouts-ville, but who cares? Met a wonderful couple at the next table, got to talking about how I love UK telly, they love US telly, neither of us can access the other and so we’ve made a Devil’s Bargain to email each other links to our favorite shows. We’ll get around these restrictions or die trying. Speaking of which, Upstairs, Downstairs debuts here tonight, Antiques Roadshow is also on and they told me how to access the Royle Family Xmas special here (BBC Iplay, which you can’t access from the States, hence the Devils’ Pact). After dinner, Greg and I walked down the street to Buckingham Palace to see it lit up at night yes, Vicky, I did yell “Chuck!” even though I know he’s not there. One day . . . There are gobs of William and Kate tat in the stores here already (yipppeee!) and I’m on the verge of tears every time I see a pub or currency exchange bureau. I know, crazy. Oh, btw, we were on the bus tour and I was telling Greg (or so I thought) about the In and Out Club in Piccadilly and the tour guide overheard me and asked, “How do you know about the In and Out Club/Melbourne House?” and so he turned off his mike and we started talking about the Melbournes and Palmerstons, about Artie’s having been at England’s first railroad fatality, about the Marble Arch, Lady Caro Lamb, etc etc etc . . . . . God, it’s good to be home. As you can see, the laptop is functioning fine, so I’ll be posting more about our trip tomorrow. Off to shower and watch Upstairs, Downstairs. I know I shouldn’t rub it in, but I promise to tell you all tomorrow. I can’t wait to see Rose . . . . Author Kristine HughesPosted on December 26, 2010 Categories Kristine Hughes, London at the New Year, UncategorizedLeave a comment on Heaven, I'm In Heaven . . .
Update 12/22 1:30 p.m. – I can’t find anything new being posted re: Heathrow on the web, nor on the t.v. news. So I’m going to go on the assumption that things are evening out, that flghts are making it in and out and that no news is good news. The news outlets apparently don’t publish stories on things getting back to normal, only on events at their worst. Using yet another cliche, while there’s good news, there’s also bad news – 20% chance of snow in London today and again on Saturday. It’s all still iffy in my mind, therefore I shall continue to pray, hope, keep my fingers crossed and sing voodoo chants while swinging a dead chicken round and round above my head. It would be much appreciated if you’d do the same. Update 12/22 a.m. – Heathrow’s second runway is now operational. I just check the arrivals – all flights arriving from the U.S. have either landed or are expected. The only airline that consistently reads “contact carrier” is British Airways. We’re flying Continental. A ray of hope . . . . . I wrote the post below a few weeks ago, when our trip to London looked certain. However, it’s now December 21st and I truly doubt we’ll be able to make it. We’re scheduled to fly into Heathrow. Go ahead, laugh. Done? Okay then, we’re flying to NJ on Thursday to spend Xmas with my mom and daughter and are supposed to then fly to London on Saturday night. As you may have heard, Heathrow is a refugee camp just now, flights both in and out are in the main cancelled and weekend flights look doubtful. More snow is predicted today for London. Sigh. Seeing as how Gatwick Airport is still running smoothly, I’ve been online to see if I could possibly book flights into that airport instead. The only flights from the NY metropolitan area that fly into Gatwick are connecting flights, with the least airtime being 11 hours. Sigh. So, I’m going to go to NJ and can only play it by ear from then on, checking with the airline and hoping (against hope) that we can make it out. If so, it looks as though it will truly be a Christmas miracle. Keep your fingers crossed for us, say a prayer and read the post below in the hopes that we actually see London. 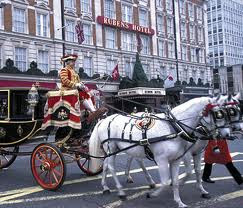 Keeping my fingers crossed that neither snow or terrorists prevent our landing, my husband, Greg, and I fly out on the night of the 25th to London and will be staying at the Rubens at the Palace Hotel, whose entrance directly faces the gates to the Royal Mews. I suppose staying at a hotel within spitting distance of the palace has a certain cache, but in earlier times the area was not one to boast about. The Rubens Hotel was purpose built in 1911/12 to house debutantes making their first court appearances at Buckingham Palace and in 1985, thirteen people were arrested in connection with a suspected IRA mainland bombing campaign uncovered by police when a bomb was discovered in the Rubens Hotel, where civil dignitaries and mayors were expected to stay for three Buckingham Palace garden parties. I’ve stayed at the Rubens before, when I was acting as tour guide during a Novel Explorations Tour. It’s marvelously English – uniformed male staff complete with top hats and gloves, a tuxedo clad pianist in the lounge in the evenings, afternoon teas and beef carved to order. Did I mention the full English breakfasts? And just a few streets away is Eaton Place, where Upstairs, Downstairs was set. You can bet I’ll be taking a stroll over there in order to take a snap for a future blog. Lucky for me, the new Upstairs, Downstairs series will be airing in the UK whilst I’m there and I’m hoping to be able to see at least one episode without having to wait until April, when it’s set to air in the States. I’ll also be looking for fabulous prizes for future contests on this blog. And I’ll be showing my husband England – he’s never been, whilst I’ve been twice since meeting him four years ago. I’m a tad nervous, as it’s important that he comes to love London, and England, as much as I do. He’s already seriously agreed that we’ll get a place across the pond one day. He is not interested in British history at all. The only thing he knows about the Duke of Wellington is that he has to walk past his portraits a few times a day. He does like watching Foyle’s War, so perhaps there’s hope. And there’s the fact that my daughter, Brooke, who is also not into history, loves London. And England in general. in my will in order to travel to London specifically for that purpose. And Brooke will do almost anything for a trip to London. We fly out to New Jersey on the 23rd in order to spend Xmas with Brooke and my Mom, then Greg and I fly to London on the night of the 25th. With snow predicted for London at Xmas, I’m packing my warmest clothes and I’ll be bringing my laptop and hope to be able to log on from time to time during our visit – stay tuned for a few “blog postcards” in the near future. My withdrawal from London was quite acute back in late July, when I found myself browsing the internet for flight deals back to the Old Smoke. Bear in mind that this was just a scant month since my whirlwind London/Waterloo tour with Victoria. However, the symptoms were all there – daydreams of walking down Piccadilly, a nostalgic longing for a pint and a proper serving of bangers and mash, the almost constant urge to throw up my arm and hail a black cab. At odd moments I’d hear a voice in my head urging me to “Mind the gap. Please mind the gap.” Aaarrrggghhh! And then I found it – Continental Airlines, Newark to London Heathrow . . . . . $345. What!? Okay, that was each way, but still, seven hundred round trip was a bargain. It was at that moment that a small, cheeky devil appeared at my left shoulder. This wasn’t your run-of-the-mill devil dressed in a red suit, with a pointed tail and holding a pitch fork. Oh, no. This devil was dressed in Regency garb and holding a snuff box. He looked uncannily like Beau Brummell. This was a novel way of looking at the situation. A very Lucy Ricardo way of looking at it, I might add. He had my attention. Thrifty? Hhmmm. My husband would like thrifty. My mouth hung open. Why hadn’t I thought of this? It was nothing short of brilliant. “Do you really think so?” I asked, already knowing the answer. Reader, I pushed the button. And just like Lucy Ricardo, I couldn’t keep my big mouth shut until my anniversary. 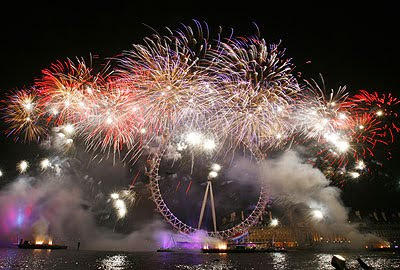 I’ve already told my husband who, thank the Lord, is thrilled to bits, which means that the only fireworks we’ll be encountering will be those over the River Thames on New Year’s Eve.